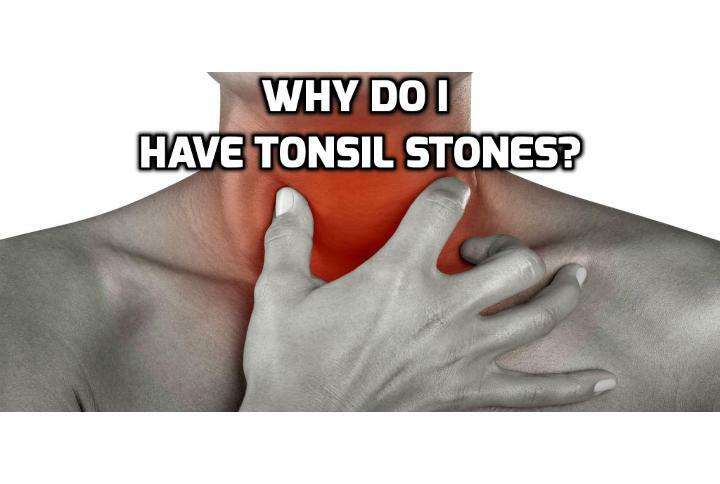 Why do people develop tonsil stones? Tonsil stones are small, whitish lumps located on the palatine tonsils at the back of your mouth. Each tonsil is positioned on either side of your tongue. When the tonsils experience the accumulation of food particles, dead cells, bacteria, viruses, or postnasal mucus, these substances can become lodged, decay, and harden inside the tonsillar crypts. Although tonsil stones can often be misdiagnosed as a throat infection, they commonly affect many people. Approximately 30,000 individuals suffer from chronic tonsil stones in the United States. People who have experienced tonsillitis have a greater risk of developing tonsil stones, as chronic inflammation can scar the tonsils and impair their defensive function. The tonsils are small, spherical balls made up of lymphatic tissue and covered by mucosa. Long channels called tonsillar crypts run through the mucosal covering of each tonsil. Tonsil stones occur when lumps of hardened food debris, mucus, and microorganisms become trapped in the tonsillar crypts. Once these trapped substances combine with saliva and its digestive enzymes, the food particles begin to break down, leaving hardened remains in the tonsillar crypts. Sensing the accumulation of foreign material, the body sends white blood cells to attack this debris, which leaves the tonsillar crypts full of hardened remains and cellular pieces. These hardened, stone-like masses of waste and debris can increase in size, which may lead to symptoms such as a sore throat, difficulty swallowing, bad breath, and earaches. Who are the people that are likely to develop tonsil stones? Individuals with larger tonsils and deep crypts often have tonsil-stone formation. Adults are usually more at risk for developing tonsil stones at the opening of the throat and airway, as they have bigger tonsils and large tonsillar crypts, which makes them more likely to harbor unpleasant debris. However, teens and children can also suffer from tonsil stones, as they may also possess larger tonsils and tonsillar crypts, dependent on the size of their tonsils based on their stage of development. Although large, fully solidified tonsil stones are rare, it is important to contact your healthcare provider to determine the best way of treating your symptoms and to prevent future complications. What can you do if you develop tonsil stones? If you observe small, white masses on the back of your throat or have swollen tonsils, or suspect you may develop tonsil stones, see your doctor for a physical examination. Based on the results of this examination, he or she may recommend that you visit an ear, nose, and throat specialist for further treatment. Previous PostPrevious Are there Any Link between Genetics and Having Tonsil Stones? Next PostNext How Best To Manage and Remove Tonsil Stones?